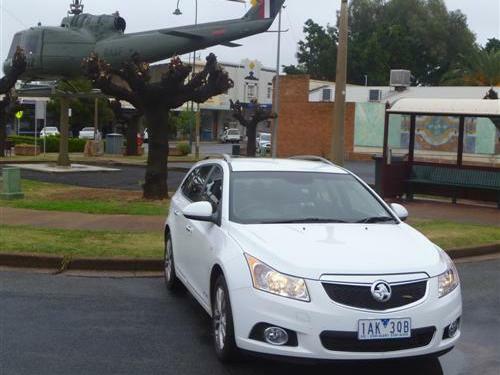 The Holden Cruze in Nyngan NSW with Iroquois "A2-022". residents during the tragic 1990 flood. 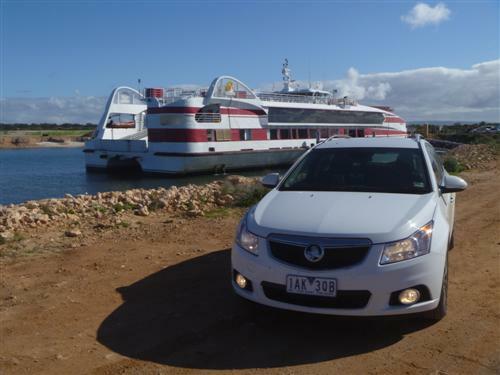 The Holden Cruze with the Spencer Gulf Ferry in SA. 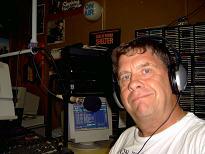 to weather and other operational requirements. Bookings are essential. 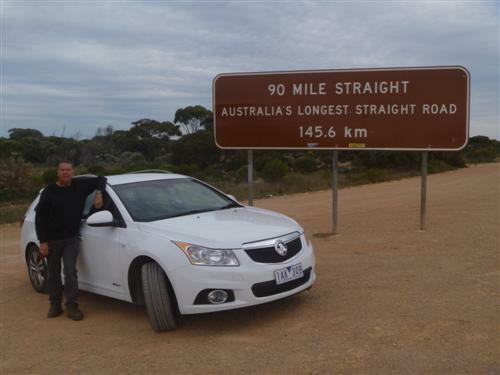 Chris Goodsell, with the Holden Cruze, on the Nullarbor. Check that sign ... it's for real! Chris Goodsell nearing the completion of the trip. 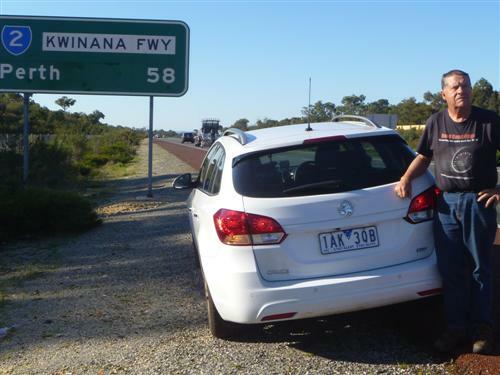 During late May and the early weeks of June my wife Vicki and I carried out an extended road test of a Holden Cruze CDX turbo-diesel wagon that would take us from Sydney to Perth via the Nullarbor and along the south coast of WA. In all, we covered some 6,400 kilometres over three weeks. Departing Sydney, we headed West via Bathurst, Dubbo and Cobar to Broken Hill – one of my favourite outback cities. The remote areas between Cobar and Broken Hill look lush. We saw hundreds of wild goats, but not much other wildlife with the exception of a few emus. From Broken Hill we headed to the beautiful city of Adelaide, staying at the seaside location of Glenelg for a couple of days. Tram rides to the city were the go! Upon departure we headed to Wallaroo to pick up the ferry across the magnificent Spencer Gulf, some 2 hours of almost ocean cruising. The ferry skipper told me they had sighted a pod of whales in the gulf the previous day. No such luck during our trip but it was magnificent none the less. Overnight was spent at Coffin Bay, the oyster capital of SA before heading off along the coast to Ceduna at the eastern edge of the Nullarbor. At this point I again conclude what a beautiful and vast country we live in and how privileged we are to travel freely in it. Ceduna is a great town and it's the gateway to the Nullarbor. We continue our trans Australia road test in the Holden Cruze CDX Turbo Diesel Wagon. My brother Greg who does Outback Driving Tips for the Road Ramblings radio programme and who has crossed the Nullarbor Plains some fifteen times alerted us to be very careful where we stayed on the Nullarbor. Some of the roadhouses offer expensive but very second rate accommodation. It is worth mentioning that driving the Nullarbor at night is not recommended due to wildlife. With the weight of a road train behind you it is quite OK, but you don't do the Nullarbor in a standard passenger car at night. Travelling between Ceduna and Eucla is probably the most exciting part of the crossing, a distance of 490 kilometres. A must stop particularly in the whale season is the Head of Bight. Diverting about 15 kms we saw around half a dozen whales within 100 metres of us. In peak season between July and September some 70 whales can be visible. The Head of Bight walks are easy and spectacular. Between the Head of Bight and Eucla there are two other very good look-outs with magnificent views of the Bight’s Bunda Cliffs. Eucla surprised me. I was thinking it was a town, but it’s little more than a roadhouse. 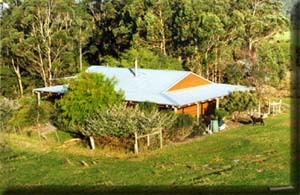 Good motel type accommodation is available. A trip out to the old telegraph station is a must. Continuing our journey we travelled Australia’s longest straight stretch of road (145kms) before stopping at the Balladonia Roadhouse overnight. Balladonia Roadhouse has a museum with some wreckage from the American Skylab that crashed in the area in 1979 as well as a Vauxhall Rally car from the first Redex Round Australia Trial. From Balladonia we completed our Nullarbor crossing and headed to the gold mining capital of Australia Kalgoorlie. Continuing our journey in the Holden we arrived at the amazing town of Kalgoorlie. We toured the town and visited the gigantic Super Pit, some 570 metres deep. This huge hole in the ground still mines gold at the rate of 28 tonnes per year and will do so for the next 30 years. We had a sit in one of the 160 tonne trucks that work the mine. Looking down into the monstrous pit the trucks down the bottom look the size of ants. After two days in Kalgoorlie we headed to a real wonder of Western Australia - Wave Rock. It’s a must see. After an overnight stop in Ravensthorpe we headed to the south coast staying at Esperance before arriving at my favourite place on the trip – Albany. Cinnamon Coloureds Farmstay ..... more. visit to WA's south coast. We visited Whale World an absolutely brilliant interactive museum on the site of an old whaling station. The ANZACs departed Albany enroute to Egypt before landing in Gallipoli. There is much to commemorate Albany’s link with the ANZACs. In fact, a series of commemorative events will occur in Albany from 31st October to 2nd November 2014 to mark the 100th anniversary of the departure of the first convoy and the significant role Albany has played in Australia’s history. From Albany we followed the South Coast Highway, via Denmark, to Nornalup and Walpole. A highlight of the Nornalup area is the amazing Valley of the Giants. Huge Red Tingles that climb some 80 metres into the sky. The skywalk gets you up to 40 metres for a better look at the Tingles. It is a must to visit! We had one more night away. It was in the retro town of Margaret River before heading into Perth to conclude the trip. Over 6,400 kms in 19 days seeing much and enjoying it greatly. For those who look for statistics the Cruze consumed 370 litres of diesel at 6.5 litres per 100ks. Total fuel cost was $617 at an average of $1.67 per litre. We 'maxed' out at just under $2 a litre along the Nullarbor. A great road trip in a very good car – I can highly recommended it after such an enjoyable adventure.